Truth is, there’s typically a medical reason for a cat not eating. And, as you can see from the list above, some of those medical reasons can be quite serious. If your cat isn’t eating their normal amount, and continues this behavior for more than two meals, it’s time for a trip to the vet. Catching these things early often results in a better prognosis, as well as easier, less expensive treatment. And this is especially the case in cats that are a bit more “plump” then they should be, as fat cats that stop getting enough calories are at higher risk of developing a serious form of liver dysfunction (hepatic lipidosis) as a result of their decreased calorie intake. Sprinkle some grated parmesan cheese on their food. The salty, cheesy flavor is often enough to pique a cat's interest and appetite. You can get the "green tube," or opt for the individual packets. Sprinkle some Purina FortiFlora probiotic on their food. Mix a little bit in and then sprinkle a bit on top. Not only does FortiFlora often work great as an appetite enhancer for cats, you're also getting the additional benefit of a proven probiotic! If these tricks fail, or if your cat refuses more than two meals, it’s time to go to the vet for evaluation and care. The tricks above are truly a short-term fix. If your cat starts eating after using one of the tricks, then you can possibly chalk it up to an upset stomach that will pass, a change in the weather, or something non-threatening. However, if your cat isn’t eating their normal amount for a significant period of time, anything over one day (even less if they have certain pre-existing conditions, such as Diabetes or obesity), then it’s imperative that you seek out hands-on veterinary evaluation. After all, something very serious could be causing your cat’s hunger strike and delay can make matters significantly worse. What is Whisker Fatigue and is it Real? You may have heard recently — either from your vet, news reports, or pet product manufacturers — about something called “whisker fatigue.” There’s actually a lot we still don’t fully understand about cat’s whiskers (read more below if you feel like getting nerdy about “vibrissae”), so the question you probably have is whether whisker fatigue is real. The answer is a firm… we don’t know (yet), but it’s certainly possible. The basic idea behind whisker fatigue is that cat’s whiskers, which are highly sensitive, can repeatedly hit the sides of a food bowl, causing discomfort, desensitization, and stress. Over enough time, this can cause the cat to stop eating entirely to avoid the sensation. Whiskers, or “vibrissae,” are specialized touch organs that help mammals in a number of ways. Cats, for example, have 100-200 nerve cells per whisker. As the whisker comes into contact with an object, the cat translates that sensory information to help build a description of their environment, like whether a space is too narrow for them to safely pass through. However, the science is still out on whisker fatigue. More to the point, there currently is no science on whisker fatigue, as there are currently no studies to say definitively whether whisker fatigue is real. But that hasn’t stopped a significant group from arguing that it’s something to watch out for. There are even a number of feeding products aimed at reducing whisker fatigue in cats, such as shallower bowls with edges that don’t touch a cat’s whiskers, and with a rounded interior so food doesn’t become trapped in the corners. But here’s the rub on whisker fatigue: The lack of current evidence doesn’t necessarily mean that it doesn’t — or couldn’t — exist. 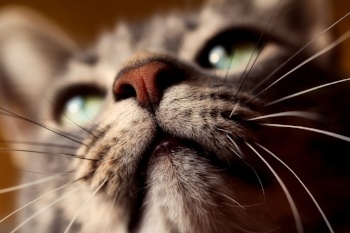 Whisker fatigue makes sense in theory, as whiskers are very highly sensitive structures/organs that could become desensitized or “fatigued” from repeated stimulation (such desensitization is a known phenomenon in other nerve fibers). Further study will likely verify some of the theory, eventually. In other words, whisker fatigue is a solid hypothesis based on interesting observations that would benefit from scientific study. Does that mean you need to go out and buy a $60 specialized whisker fatigue bowl? Absolutely not. In fact, a low-sided bowl — or even a plate — will work just fine. 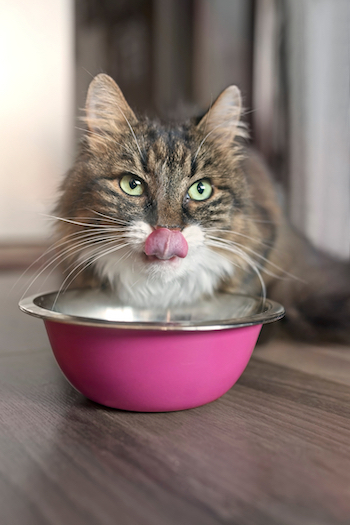 Read on to learn about picking the right bowl for your cat and tricks to tempt an inappetent (a fun way to say “not hungry”) cat’s appetite. 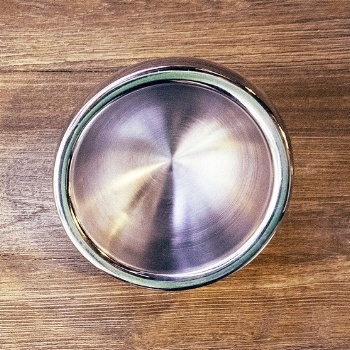 What Type of Feeding Bowl is Best for Your Cat? Clearly, there are a ton of options available when you’re deciding how to feed your cat. If you’re concerned about whisker fatigue, find a plate or a wide bowl with shallow sides so there’s less chance your cat will have to squish their whiskers against the bowl. Preferably, opt for stainless steel when it’s available. It’s not only durable, but also easy to clean and disinfect. Similarly, ceramic and glass bowls can work, though they’re easier to break. Avoid plastic bowls or containers as they can harbor bacteria when chipped or scratched, which can lead to problems like cat acne. For suggestions on types of bowls and feeders click here. Better yet, consider other ways to feed your cat that will engage their natural instincts. Cats are not naturally prone to scarfing down a big meal for the day. As hunters, cats are more accustomed to hunting their food and eating little bits throughout the day. Periodic, small feedings — especially feedings that require your cat to move around and “hunt” their food, like from a food puzzle — can help keep your cat from becoming overweight and give an indoor cat an outlet for their pent-up energy. At the bare minimum, don’t give your cat one big meal in the morning or even leave their kibble out all day for them to “free feed." Chances will be greater that they “scarf and barf” and you’ll miss important opportunities to monitor their food intake. If you’d like to go a step further, something like the NoBowl feeding system is one way to tap into that natural hunting behavior. This particular device looks like a mouse and allows you to place a few kibbles inside. You then hide the “mouse” and let your cat do what it does best. If you have more than one cat and need help keeping them separated when feeding, click here for more tips. Have any stories about your cat’s finicky eating habits? Any questions we haven’t touched on here? Let us know in the comments! Please share a bit of information about your cat's food and litter box. The information you share will help many other cats. It's anonymous and will take 1- 2 minutes.